Freshly sliced, paper-thin deli meat on fresh baked bread is a delight for carnivores of every variety. Whether you prefer roast beef, capicola, corned beef, prosciutto, or good old fashioned roast ham and turkey, the thinner the slices the better the sandwich For most people, getting your deli fix means a trip to the local deli counter or corner deli shop, but it doesn’t have to be that way. You can save money, control your portions, and enjoy finely sliced deli meats any time with your own home meat slicer. Buy meat in bulk from the local deli or butcher and slice it up as thin as you like, or make the most out of leftover roast ham and turkey around the holidays. You can also use it for better portion control when making sandwiches, helping you make sandwich masterpieces that are as nutritionally balanced as they are delicious. How do you know which meat slicer is the right one for your kitchen? Check out our product reviews for more information, as well as our pick for best value. This machine is truly a miniature deli grade meat slicer, complete with all stainless steel and cast aluminum construction. Like its larger cousins, the 615A has stainless steel blade capable of cutting food from fine deli meat and cheese to fruit and vegetables. Every component of this machine is removable for cleaning, including the carriage, blade, deflector and width guide. Furthermore, the blade and carriage both lock with the touch of a button, preventing accidental activation or potential injuries when working or moving around the slicer in your kitchen. Honestly, the best characteristic of this meat slicer is its extremely small footprint. Thanks to the short diameter 7-inch cutting blade and the compact base and carriage design, the Chef’s Choice 615A takes up minimal counter space, allowing you to have thin-shaved meat whenever you want even if counter and storage space is at a premium. This is a solid value that’s easy to use, performs well, and can handle any fine slicing tasks you can throw at it. A more cost-effective, home-kitchen-sized slicer, the Elite Gourmet EMT-503B is a great option for anyone who is looking to prepare their own deli sliced meats, cheeses, and even breads and baked goods. Put your favorite bagel on the carriage and make your own homemade bagel chips quickly and easily, or make perfect slice of baguette for crostini or bruschetta. The blade 7.5-inch blade is serrated for greater cutting versatility, and you can easily cut slices as fine as your local deli or up to half an inch thick. In terms of construction, the housing is made of die-cast aluminum, and all carriage components and trays are made of easily washable plastic. There’s also a sturdy transparent blade guard that locks in place over the edge when your slicer is not in use, making it as safe as it is durable and easy to clean. This is an ideal slicer for those who want to drop a plate in front of the slicer, load up their prosciutto, provolone, or baguette and spin up the blade. In no time at all, anyone can have perfectly sliced meat, cheese, and bread for appetizers, sandwiches, or wine and cheese pairing trays. Consider the EMT-503b if you want an inexpensive slicer that provides high quality results with a small footprint and easy to clean components. Some home chefs are content with consumer-grade products in their kitchen; others demand commercial grade products because they want the best. For the latter category, Best Choice makes this 10-inch blade model meat slicer. With a 240-watt motor (twice the power of standard home meat slicers), the Best Choice is designed for constant heavy duty use. Machined stainless steel construction and die-cast aluminum parts mean this machine can stand up to hours of heavy use, and it is fully capable of anything a standard manual deli meat slicer at your local counter or shop can handle. Thanks to the 10-inch diameter cutting wheel, this machine can also handle large cuts of beef brisket, salami, lamb, and even whole turkey breasts. In a busy restaurant kitchen, the ability to create finely sliced cuts of meat for appetizers, soups, and entrees cannot be overestimated. Additionally, this model includes dual whetstones for easy self-sharpening, and all components that come in contact with food can easily be removed, washed, and sterilized at home or for commercial use in a restaurant kitchen. All in all, if you want what the pros have to use in your own kitchen, this is the model to buy. Commercial grade deli slicer you can use in your own home. For those requiring a bigger blade for larger sections of ham, turkey, or deli meats like salami and capicola, this 8.7-inch slicer should fit your need nicely. The all stainless steel housing and parts make it more durable than other non-commercial models, and it can be scrubbed and sterilized between uses far more easily than slicers with all plastic parts. The blade guard encompasses all but the section covered by the meat carriage, and it can be locked closed while not in use to prevent accidents. Despite its manual operation, making thin slices quickly is easy thanks to the well-designed mechanism. Dial-in the width you want, drop your meat on the carriage, and start carving away paper thin slices for sandwiches or thicker cuts for holiday meals and entrees. However you choose to use it, this model offers one of the best value-to-cost ratios out of the slicers we reviewed, and it should give you many years of faithful service. Pass-through blade means meat to be cut is on the opposite side from where your slices are collected. Another commercial-grade model for exacting home chefs or use in restaurant kitchens, the Beswood 10” Premium Electric Slicer has a chromium-plated carbon steel blade that requires far less sharpening than most machines, and its heavy-duty stainless steel components ensure you will be using this for high volume slicing for many years to come. Thanks to the 240-watt motor, this model is fully capable of taking down a whole ham, large turkey breast, or beef roast in a matter of minutes. Make paper thin slices for sandwiches and appetizers, or prepare your meat for serving at entree width quickly and easily. The locking carriage keeps the blade covered when not in use for safety, and the blade guard covers all but the cutting edge to protect you or your kitchen staff from cuts while operating the slicer itself. This model may be large and heavy, but like a tank it can stand up to use and abuse without compromising its function in any way. The Beswood is definitely an excellent first choice for anyone running a restaurant kitchen or looking for professional grade deli cuts at home. One of the drawbacks of most commercial-grade deli slices is they are heavy, bulky and take up significant space in the kitchen or workspace. Super Deal’s model deals directly with those issues by being lighter, smaller, and every bit as powerful as larger commercial grade models. It combines high-end features like a self-sharpening blade with standard safety features like a locking carriage and semi automatic operation. Additionally, with a ⅓ horsepower motor, this machine can keep the blade cutting through just about any type of meat you drop on the carriage for slicing. The ring guard for the blade also protects operators and those moving in the kitchen from accidental exposure to the blade, and dialing in your desired width up to 13mm is easy thanks to the side-mounted width guide control. If you need a meat slicer that fits in small spaces and is every bit as good as a much larger and heavier commercial model, the Super Deal Commercial Stainless Steel Semi-Auto Meat Slicer should be at the top of your list. A full-size, 10-inch blade model designed for use in professional kitchen settings, this slicer is up to high volume, large cut slicing jobs. The F2C has a 240-watt motor that keeps the blade turning at 530 RPM, which means making ultra-fine slices from large cuts of cured or prepared meats takes no time at all. The carriage guard is also transparent so you can keep a close eye on how the blade is performing and how thick your cuts are turning out as you cut. Dialing in your desired width is easy thanks to the side-mounted width control, and the ring guard keeps you and everyone near you safe from the blade while you are cutting. Better still, the ring guard is fixed with a locking knob that lets you remove it for easy cleaning, and the carriage can be locked into place while the slicer is not in use to keep the exposed portion of the blade covered. Additionally, this is also one of the quietest running deli slicers in its class, cutting down on the noise level in the kitchen and making it easier for staff to communicate clearly even when they are running off shaved slices of roast beef, ham, or other deli meat. Any chef or restaurant manager/owner should definitely look into the F2C if they need a high quality commercial deli slicer for their kitchen. When extra horsepower for high-volume cutting work is your top priority, you want to consider the KWS Premium Commercial Electric Meat Slicer. The 320-watt motor is more powerful than other commercial-grade slicers, and the aluminum alloy base and die-cast steel parts ensure this is both a lightweight and highly durable kitchen appliance. The KWS comes with all the standard safety features like a locking carriage ring guard for the blade, and your desired width can be easily dialed in on the side using the width control. Better still, the blade is self-sharpening thanks to an internal mechanism, so you don’t have to break it down and sharpen the blade periodically like you do with other machines. Furthermore, despite its significantly higher power rating, this is also one of the quietest running commercial grade slicers on the market, even in smaller kitchens and workspaces. If you plan to depend on your slicer for high volume slicing on a daily basis, the KWS should definitely be among your top picks for your professional or home kitchen. It has all the power, precision, and safety features you want in a commercial kitchen appliance, and it is easy and comfortable to operate for hours at a time. Definitely check this one out if you need a high-end deli slicer for your home or restaurant kitchen. Are you ready to work that slicer? The Giantex 10” Blade Commercial/Industrial Meat Slicer is ready for you. This is one of the most powerful non-automatic meat slicers on the market, and it is exceptionally comfortable to use, too. It has a self-sharpening blade system that allows you to engage the whetstones only as needed, preserving the lifespan of your blade while keeping it operating at peak efficiency. There is no type of boneless meat this slicer cannot handle: mutton, beef, venison, and all manner of cheeses and other deli specialty meats fall away in paper-thin sheets from the edge of the Gitantex 10-inch high carbon stainless steel blade. All stainless steel parts and a die-cast aluminum base round out the composition of this high-volume slicer, and it is clear right out of the box that you will be using this slicer for a long time. Much of the value of this meat slicer are found in the little details toom like the transparent carriage guard, fixed carriage operator handle, and locking ring guard and carriage. As far as cost-to-value ratio is concerned, this is an outstanding unit you will have in your kitchen for a long time, and it will provide you with years of faithful service with minimal maintenance. 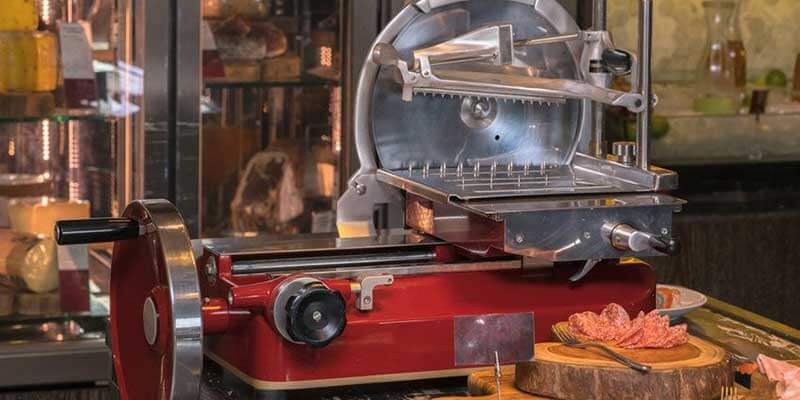 Designed as a middle-tier meat slicing solution, the Berkel 825A-Plus has many features normally found only on high end commercial models without the weight and counter space requirements that come with them. If you are doing low-volume slicing (3 hours or fewer per day), this slicer is perfect for your needs. It is gravity fed, which means it requires less effort from the operator to keep slices consistent, and the width can easily be dialed up or down using the on-board front-mounted control from 0-1/2-inch cuts. The carriage features a safety lock to prevent blade exposure when not in use, and the ring-guard also locks into place to protect the operator and others from accidental exposure to the blade. The motor produces ⅓ horsepower and keeps the blade spinning fast enough to make those highly desirable near-transparent slices of deli meat while still working wonders with breads and cheeses. All in all, this is a great system for homes and light use in a commercial setting like a coffee shop or cafe where you are cutting smaller volumes of meat on a regular basis. Home chefs will find it often exceeds their needs, while those in a professional kitchen needing occasional slicing capability will find it to be the perfect fit. My top choice out of all ten slicers is definitely the BESWOOD 10" Premium Chromium-plated Carbon Steel Blade Electric Deli Meat Cheese Food Slicer. I like the heavier weight and stability it has resting on the countertop, and I much prefer the chromium plated blade since it requires almost no sharpening over the slicer’s lifetime. It’s also got a 240-watt motor and a 10-inch blade, which means less carving before putting my meat or cheese on the carriage to be turned into sandwich slices or a deli hors d'oeuvres tray. If you are looking for a high-quality commercial grade slicer for your home or deli/restaurant, definitely consider the BESWOOD 10" Premium Chromium-plated Carbon Steel Blade Electric Deli Meat Cheese Food Slicer.